Mechanical Carbon（PTS）｜Products｜Totan Kako Co., Ltd. Cost effectiveness of the PTS product is demonstrated by molding products to near shape by automatic press-to-size machine. 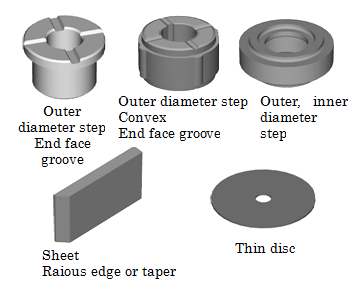 Options such as outer diameter step, inner diameter step, groove and chamfering are available through powder molding. Specially treated powder make it possible to mold products even with its thickness range from 1.5 to 2mm. 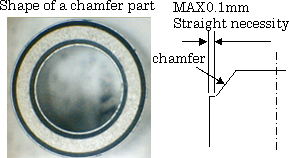 Still, a straight part 0.1mm shown below is necessary in order to avoid sharp edge of metal mold as far as the shape of chamfering is concerned. The size of targeted products is basically within 30mm for outer diameter, 20mm for thickness. However, other size is available upon request. 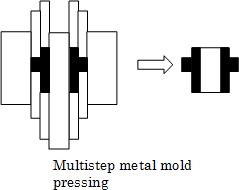 (1) Skipping subsequent machining is possible by molding products to near shape. (2) Although a special metal mold for each product is a must, streamlining is realized by automatic press-to-size machine. (3) Mass production and quick delivery is possible because of short baking time. (4) Cost reduction is possible because we can reduce machining. (5) Tolerance is plus,minus 0.4% of a basic sized product when there is no machining process to finish up. Copyright © Totan Kako Co., Ltd. All Rights Reserved.